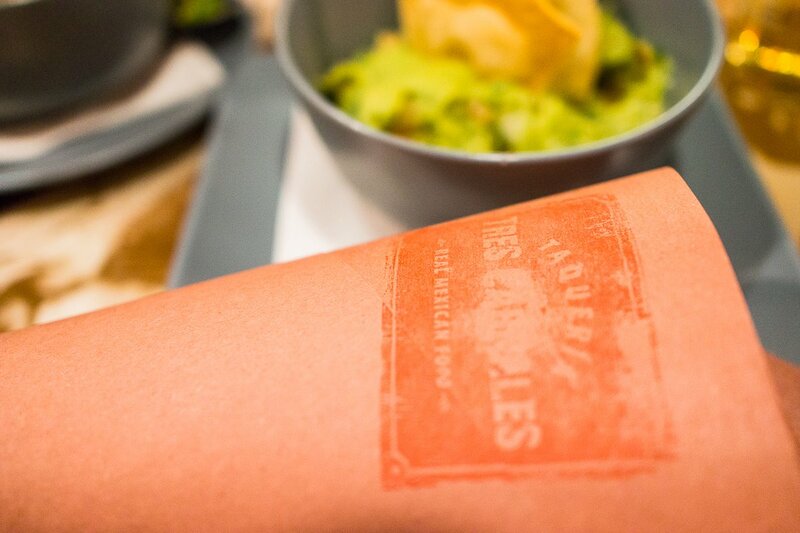 You are here: Home » Tres Carnales – “Tacos for the People” Indeed! 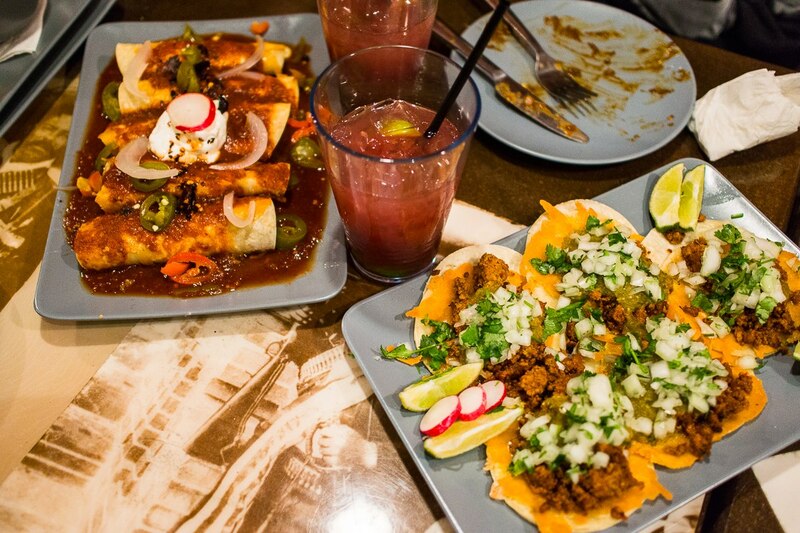 Tres Carnales – “Tacos for the People” Indeed! Recently a friend asked for restaurant recommendations for Edmonton. I did what I usually do, asked for more specifics (i.e. “What type of food do you like?” “What price range?” “Who are you taking?”) and also provided her with a short list of my favourite spots. There are two Edmonton restaurants that continually make it on my recommendations list. These two restaurants almost always get glowing reviews from family and friends who try them based on my recommendations. One of those places I’ve written quite an extensive post about in the past – Corso 32. 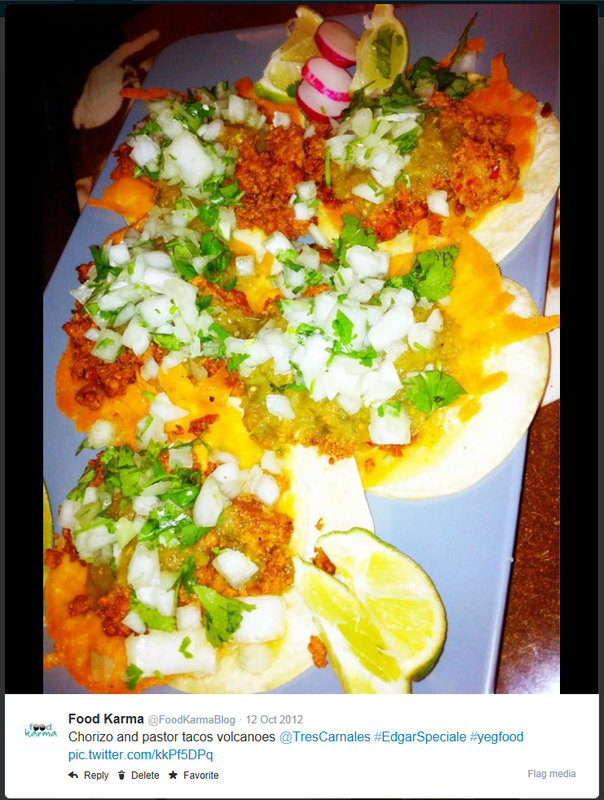 But shockingly, I realized that I had yet to write about my other Edmonton favourite – Tres Carnales. Considering how often I frequented Tres, and how much I’ve recommended it.. this is quite the oversight so I thought I would try to sum up all the incredible fun times I’ve had at this joint in one post. I first encountered Tres Carnales at the Al Fresco 104 St Block Party in June 2011, we had their Elotes (Mexican Street Corn). Grilled on the cob, slathered with seasoned creamy mayo. It was a delicious introduction. So, a few months later when Twitter was all a buzz about their feature Tacos Pescado, I rushed down to their new space and ordered me some sangria and red snapper tacos. I was hooked! They were the best fish tacos I’d had in Canada. I was there after work, around 5pm and the place was quiet, awaiting a dinner rush. Chris, one of the partners came over to check in on me and we got to talking. I loved that the three owners were looking at trying out different features, and were committed to sourcing the best quality, local-as-much-as-possible, and fresh ingredients. No freezer on the premises. The Red Snapper I was consuming in that moment was used as an example. The fish was flown in fresh from BC, fried in a light tempura-like batter, and accompanied with simple accompaniments so that the fish remained the focus. 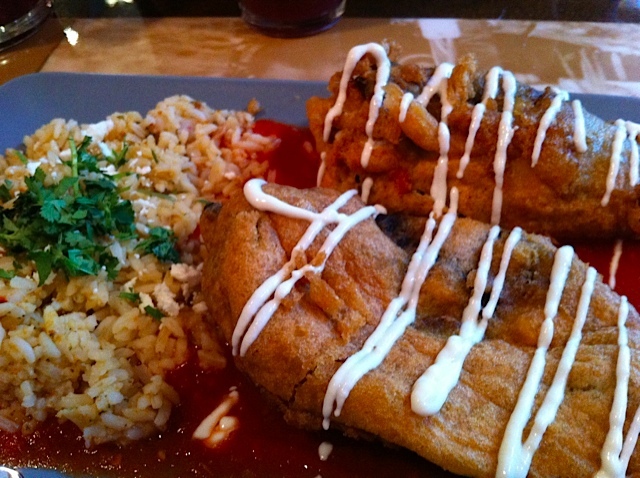 From that point on, every time Tres Carnales had Tacos Pescado on as a feature, I was there! 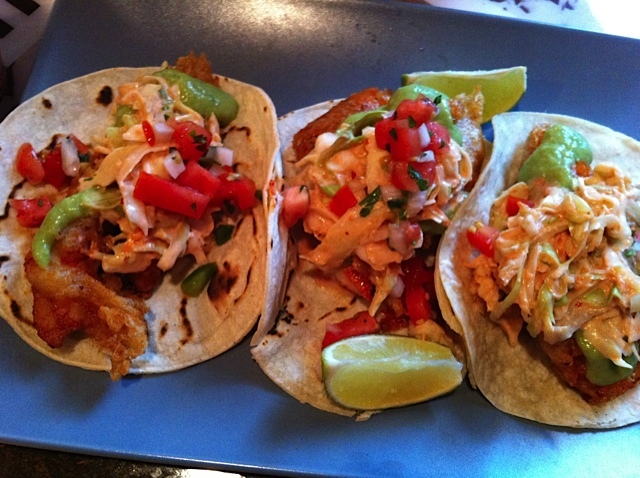 It wasn’t long before these awesome fish tacos became a regular menu item, but we still kept frequenting the place for their awesome hospitality, sangrias, and whatever great feature the kitchen was pumping out at the time (mmm Enfrijoladas de Pato). I wasn’t the only one. 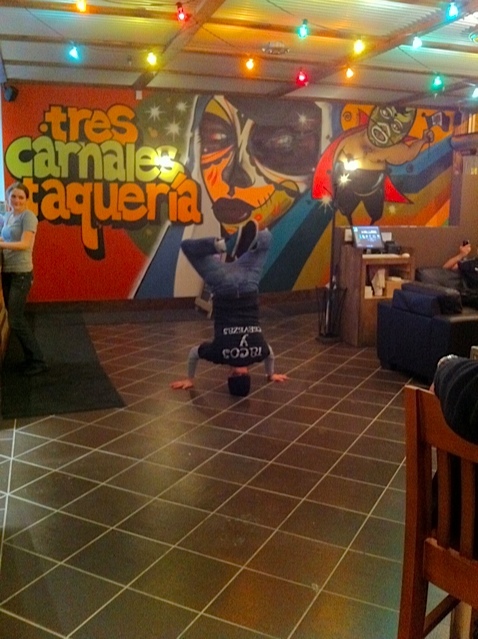 Tres Carnales’ popularity soared within their first year. It quickly became the “it” spot with long lines forming 30 minutes prior to their Saturday dinner service. It was featured on numerous blogs, magazines, and even on Food Network’s “You Gotta Eat Here”. It’s not difficult to pin point why Tres Carnales has such a large following. They offer a non-pretentious fun space with delicious food and drinks, but at the heart of it, the three partners who own the restaurant offer amazing hospitality. I quickly found out that Chris coming over to check in on me during my first visit, was quite a normal occurence. Rarely will I go by the restaurant and not see Chris or Dani working the line and crowds, greeting customers, running tequila, and making everyone feel great. On one visit we got to talking about our upcoming trip to Puerto Vallarta, and Dani sent us a long list of his recommendations having grown up in PVR (which by the way were awesome). But that level of sincerity and generosity is unparalleled. Edgar, the third partner can also be found quite regularly in the kitchen cooking alongside the staff. A couple times, we had the luxury of trying some of Edgar’s off-menu items and each time we’ve been amazed at the execution and flavours. My sister still refers to his Chille Rellenos as the best she’s had. And yes, so much of Tres Carnales’ spirit comes from Dani, Chris, and Edgar. But even now, as the three Carnales are gearing up for the opening of their second restaurant, their team continues to provide the awesome personal touches. Hospitality and fun has been ingrained in the Tres Carnales culture, and it’s why they have such a great reputation. Speaking of their second restaurant, Rostizado (@rostizado_yeg) is scheduled to be opening in a few weeks at the Mercer Warehouse. In an article with the Edmonton Journal, the guys give some hints for the new concept. Mexican rotisserie chicken and pork. Having had succulent Mexican grilled chicken in Texas recently, I’m beyond stoked, can’t wait for such a concept to hit Alberta. I just wish they would open a location in Calgary soon. Since I’ve moved back to Calgary, I’m going through Tres withdrawals. So for all my friends and family who are planning visits to Edmonton, make sure you stop into Tres Carnales for some good eats and generous Mexican hospitality!